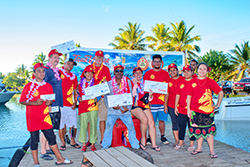 Pohnpei—The True Value tournament went off without a hitch last weekend and everyone had a great time. For once in recent history, the weather cooperated and we didn’t get drenched at the weigh-in. 15 boats went out and they all brought in some nice fish. 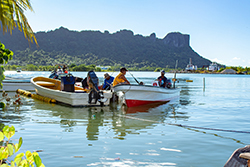 We want to thank all of the sponsors that supported the tournament: Pohnpei True Value, San Miguel, Ambros Guam, Jonquil, Monje, Hardiflex, Pryzm, Nihon Tekkan and House of Travel. The sponsors really supported the fishing club. Each boat registering and going out received a free case of Red Horse, a huge free cooler, hats and t-shirts. Everyone is completely geared up until the next event. The weigh in was at the causeway in Dekehtik and a good crowd joined us for the festivities. Good food, good music, and good fun. All of the anglers were competing heavily for the prizes, and there were good prizes on offer. 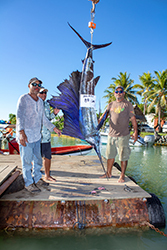 The winner was Alex Wichep with an 89 pound sailfish; a really nice fish and a top catch. 89lb. Sailfish Alex Wichep who won a round trip ticket to Guam provide by House of Travel and two lures provided by Pryzm. Congratulations to all the winners. We want to encourage everyone to support the sponsors, and drink your Red Horse responsibly. Thanks also to everyone who helped out: Bill, Tina, Praise, Cel and all the guys on the floating dock. See you next month at the Bud tournament, November 10.